The party’s General Secretary says the time has come to “move on” from former Naas mayor Darren Scully’s comments about black Africans. 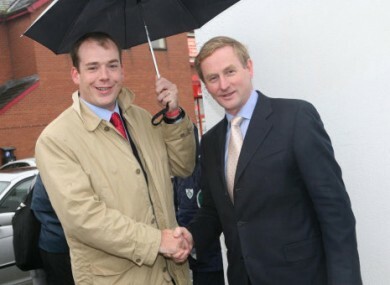 File photo of councillor Darren Scully welcoming Taoiseach Enda Kenny to Naas in October, 2006. THE FORMER MAYOR of Naas, who was forced to resign after comments he made about black Africans, has been welcomed back into the Fine Gael party. Darren Scully, who said that he would not represent black Africans because he had been “met with aggressiveness, I have been met with bad manners, I have also been played the race card”. Scully subsequently apologised “unreservedly” for his remarks and resigned as mayor of the Kildare town, claiming his remarks were “open to interpretation” that he did not intend. He was then stripped of the Fine Gael whip, later telling TheJournal.ie that “certain sections of society” wouldn’t be happy until he was “deported somewhere”. Labour TD Aodhán Ó’Ríordáin reported the comments to gardaí. Now, some 20 months after the controversy, Fine Gael has welcomed him back into the fold. Scully will contest next year’s local elections under the Fine Gael banner, aiming to repeat his result in 2009, when he topped the poll. Speaking to KFM today, the party’s General Secretary Tom Curran said that the time had come to forgive Scully and move on. Curran said that there was a “general acceptance” within the party that it was time to move on. “What he did was wrong. He has paid the price. Everyone deserves the chance to redeem themselves. I am sure of a number of things. I am sure that Darren is not a racist, I am sure that what he said was wrong and I am sure that he has learned from a major mistake he made in his political life. Email “Racism row councillor re-admitted to Fine Gael”. Feedback on “Racism row councillor re-admitted to Fine Gael”.